I was looking over last year's planting schedule. Okay, I'm bad. I wrote it on a calendar that I threw into recycling. So now I'm dependant on blog posts and Flickr pictures to see what I planted when. The bad part, how many seedlings made it to maturity and got planted in the garden? Yes, no data. Although four or five leeks made it to maturity. But which species? Tardorna or King Somebody or another? No clue. This year will be very different from last year. Last year it was super warm with temperatures 15 to 20° F above normal. This year we had alternating bitter cold with normal winter temps. Tonight it went down to around 13° but is warming fast as snow approaches. The next three days are predicted to be in the forties (highs) and followed by days in the upper thirties. The snow will melt. If rain holds off, I should look at tree trimming. Yup, those mulberries still need to be tamed. And nope, I still don't have a chipper shredder. I'm holding off until new moon to start planting seedlings. Last year, when it was warm, I started in January. The lettuce made it. I have notes telling me to plant more. This year, I'm following One Yard Revolution's planting guideline. Even though I am one zone further south, our last frost date has been really late in years with cold winters. In 2015 and 2016, we had frost on or after Memorial Day. Since I'm at Great Lakes Fiber, there is no one to cover plants. I set up one low tunnel so far. I need greenhouse plastic and a pH meter next to get started planting under cover. Very not happy with T-5 LED grow lights. They almost cause physical pain to look at. They are like seeing an SUV with blue headlights, blinding you at night. I do like the bulbs I bought from Gardener's Supply catalog last year. Those are darn useful and not so blue. I use them as Ott lights for color checking and to take pictures. 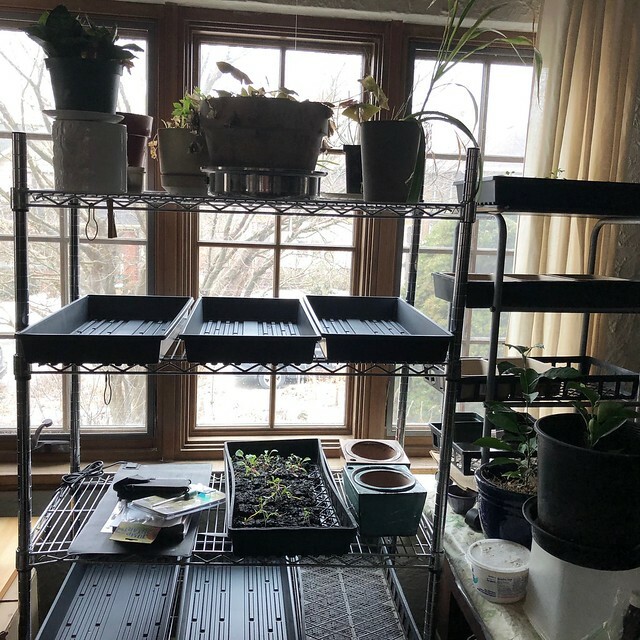 So far, I brought up all my trays and some pots out of the basement. They got a good scrubbing and then a dip in bleach water. Furniture's been moved around too. I still need to write to Ag Extension as well as call the lab. I want my soil checked for lead near the house and garage and because I have an area with pressure treated wood, arsenic. The normal soil tests run $9 but only give you composition, pH, nitrogen, phosphate, and potassium levels. I need additional testing. It's been 25 years since the last time the soil was tested. My original pH was 8.0 with little phosphate or nitrogen. The soil has a lot of potash and clay. I think I'm due for a test. Next week I am registered for a Farm Funding seminar. Hopefully snow will hold off.